A sinh transformation has recently been proposed to improve the numerical accuracy of evaluating nearly singular integrals using Gauss-Legendre quadrature. It was shown that the transformation could improve the accuracy of evaluating such integrals, which arise in the boundary element method, by several orders of magnitude. Here, this transformation is extended in an iterative fashion to allow the accurate evaluation of similar types of integrals that have more spiked integrands. 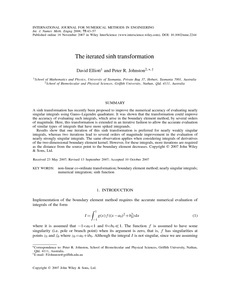 Results show that one iteration of this sinh transformation is preferred for nearly weakly singular integrals, whereas two iterations lead to several orders of magnitude improvement in the evaluation of nearly strongly singular integrals. The same observation applies when considering integrals of derivatives of the two-dimensional boundary element kernel. However, for these integrals, more iterations are required as the distance from the source point to the boundary element decreases.